within Human CPT2/CPT1 aa 600 to the C-terminus. The exact sequence is proprietary. Human fetal liver and fetal kidney lysates; Human liver and skeletal muscle tissues; MCF7 cells, Rat kidney and liver lysates, Mouse heart and kidney lysates, Mouse kidney tissue and Rat colon tissue. Our Abpromise guarantee covers the use of ab181114 in the following tested applications. WB 1/1000 - 1/10000. Detects a band of approximately 67 kDa (predicted molecular weight: 74 kDa). Defects in CPT2 are the cause of carnitine palmitoyltransferase 2 deficiency (CPT2D) [MIM:255110, 600649]; also known as CPT-II deficiency or CPT2 deficiency. CPT2D is an autosomal recessive disorder characterized by recurrent myoglobinuria, episodes of muscle pain, stiffness, and rhabdomyolysis. These symptoms are triggered by prolonged exercise, fasting or viral infection and patients are usually young adults. In addition to this classical, late-onset, muscular type, a hepatic or hepatocardiomuscular form has been reported in infants. Clinical pictures in these children or neonates include hypoketotic hypoglycemia, liver dysfunction, cardiomyopathy and sudden death. Defects in CPT2 are the cause of carnitine palmitoyltransferase 2 deficiency, lethal neonatal (CPT2D-LN) [MIM:608836]; also known as lethal neonatal CPT-II deficiency. It is a lethal neonatal form of CPT2D. This rarely presentation is antenatal with cerebral periventricular cysts and cystic dysplastic kidneys. The clinical variability of the disease is likely attributed to the variable residual enzymatic activity. Lanes 1 - 4: Merged signal (red and green). Green - ab181114 observed at 70 kDa. Red - loading control, ab8245, observed at 37 kDa. ab181114 was shown to specifically react with CPT2/CPT1 in wild-type HAP1 cells. No band was observed when CPT2/CPT1 knockout samples were examined. Wild-type and CPT2/CPT1 knockout samples were subjected to SDS-PAGE. Ab181114 and ab8245 (Mouse anti GAPDH loading control) were incubated overnight at 4°C at 1/1000 dilution and 1/10,000 dilution respectively. Blots were developed with Goat anti-Rabbit IgG H&L (IRDye® 800CW) preabsorbed ab216773 and Goat anti-Mouse IgG H&L (IRDye® 680RD) preabsorbed ab216776 secondary antibodies at 1/10,000 dilution for 1 hour at room temperature before imaging. Immunocytochemistry/Immunofluorescence analysis of MCF-7 (human breast carcinoma) cells labelling CPT2/CPT1 with purified ab181114 at 1/100. Cells were fixed with 100% methanol and permeabilized with 0.1% Triton X-100. ab150077, Alexa Fluor® 488-conjugated goat anti-rabbit IgG (1/1000) was used as the secondary antibody. 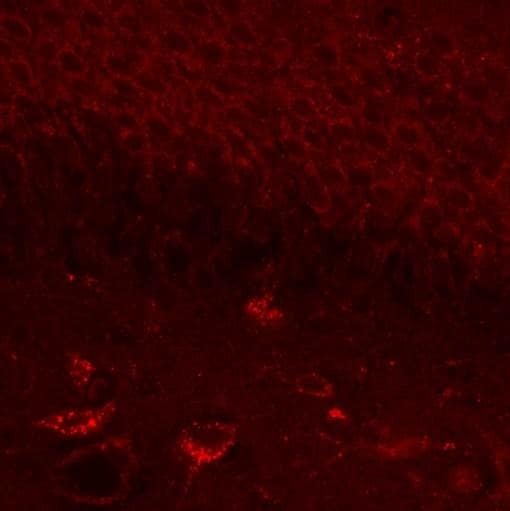 The cells were co-stained with ab7291, a mouse anti-tubulin antibody (1/1000) using ab150120, an Alexa Fluor® 594-conjugated goat anti-mouse IgG (1/1000) as the secondary. Nuclei couterstained with DAPI (blue). For negative control 1, rabbit primary antibody was used, followed by anti-mouse secondary antibody (ab150120). For negative control 2, mouse primary antibody (ab7291) was used followed by anti-rabbit secondary antibody (ab150077). Immunohistochemical analysis of paraffin embedded rat colon tissue section labelling CPT2/CPT1 with purified ab181114 at dilution of 1/50. The secondary antibody used was HRP-conjugated Goat Anti-Rabbit IgG H&L (ab97051) at dilution of 1/500. The sample was counter-stained with hematoxylin. Antigen retrieval was perfomed using Tris-EDTA buffer, pH 9.0. PBS was used instead of the primary antibody as the negative control and is shown in the inset. Immunohistochemical analysis of paraffin embedded mouse kidney tissue section labelling CPT2/CPT1 with purified ab181114 at dilution of 1/50. The secondary antibody used was HRP-conjugated Goat Anti-Rabbit IgG H&L (ab97051) at dilution of 1/500. The sample was counter-stained with hematoxylin. Antigen retrieval was perfomed using Tris-EDTA buffer, pH 9.0. PBS was used instead of the primary antibody as the negative control and is shown in the inset. Immunohistochemical analysis of paraffin embedded human liver carcinoma tissue section labelling CPT2/CPT1 with purified ab181114 at dilution of 1/50. The secondary antibody used was Goat Anti-Rabbit IgG H&L (HRP) (ab97051), at a dilution of 1/500. The sample was counter-stained with hematoxylin. Antigen retrieval was perfomed using Tris-EDTA buffer, pH 9.0. PBS was used instead of the primary antibody as the negative control and is shown in the inset. Immunohistochemical analysis of paraffin-embedded Human liver tissue labeling CPT2/CPT1 with unpurified ab181114 at 1/100 dilution, followed by prediluted HRP Polymer for Rabbit IgG. Counter stained with Hematoxylin. Immunohistochemical analysis of paraffin-embedded Human skeletal muscle tissue labeling CPT2/CPT1 with unpurified ab181114 at 1/100 dilution, followed by prediluted HRP Polymer for Rabbit IgG. Counter stained with Hematoxylin. Immunofluorescent analysis of 4% paraformaldehyde-fixed MCF7 cells labeling CPT2/CPT1 with unpurified ab181114 at 1/100 dilution, followed by Goat anti rabbit IgG (Alexa Fluor® 488) secondary antibody at 1/200 dilution. Counter stained with Dapi. Publishing research using ab181114? Please let us know so that we can cite the reference in this datasheet.